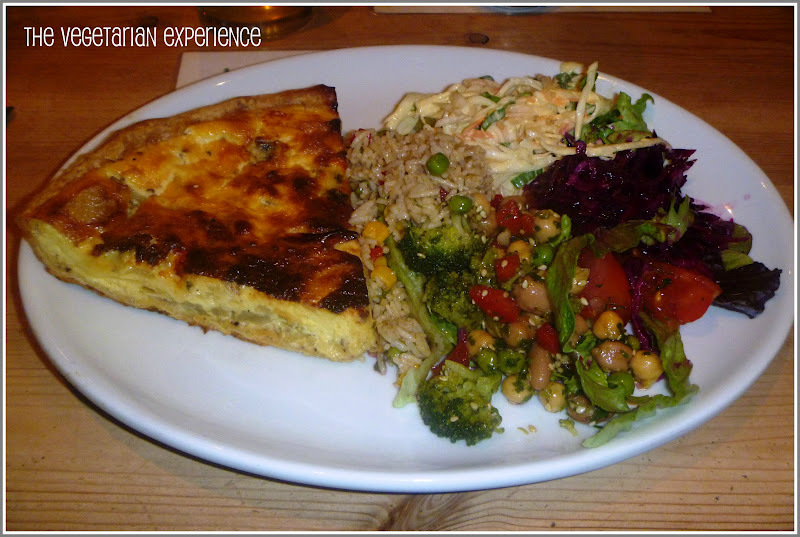 A few weeks ago a few of us from our local Vegetarian Mum's group went along to Woody's Vegetarian Cafe - a Vegetarian cafe/restaurant based in Apsley Marina. Apsley Marina is an area built around the Grand Union Canal in Herts and features a compact mooring for Narrowboats. It also has a variety of restaurants and pubs surrounding it and is a fab place in the summer especially, as you can take walks along the canal and look at the boats, and then dine outside of one of the many restaurants and pubs. I have been to Woody's Vegetarian Cafe quite a few times now and enjoy eating somewhere where I know that by eating there, I am helping to support green initiatives. Woody's value and support green initiatives. Their electricity is from The Good Energy Company and is 100% renewable. Their water system is filtered and used in their drinks and soups, they use eco-friendly cleaning products and recycled paper from the local mill and they recycle as many of the cans/bottles/tins and materials they use as possible. Woody's source a lot of their food from Organic and Fairtrade suppliers. They also buy from local producers with seasonal fruit and vegetables brought and grown locally. 95% of the food served is made on the premises. I have visited Woody's a number of times now and have enjoyed a delicious meal each time I have been. One of the best things about eating at Woody's is that I can peruse the menu knowing that everything on there is Vegetarian. Therefore, I can choose from the whole menu and I don't have to try and decipher the ingredients to decide if the dish really is vegetarian or not, as I do at other restaurants. Woody's offers a wide range of menu choices including specials which change regularly and are not on the Main Menu. Main Menu dishes include Pizza's, Soups, Salads and Crepes (Sweet and Savoury). They also have Vegan and Gluten Free options available. Their specials include Vegetarian Burgers, Jacket Potatoes, Mexican Crepes, Quiches, plus a whole array of other dishes. The atmosphere is relaxed at Woody's with low key lighting, candles and green plants and vines draped throughout the restaurant. Wooden tables and chairs adorn the restaurant as do paintings and canvases from local artists. The main counter and kitchen is open, so you can see the food being prepared for you, which personally I prefer to a closed kitchen where they could be doing anything to your food and you would never know! My Vegetarian friends and I all agreed that we really liked the ambience of Woody's and after a day spent running around after the kids, a meal in a relaxed, stress free environment was just what we needed! After scouring the menu and specials board, and debating what to eat because it all looked so delicious, I chose the Vegetable Quiche served with an array of side salads as my main course. At around £9, I did think that the Vegetable Quiche was rather expensive, and I would like to have seen something potatoish on my plate also for paying that amount of money, however, bearing in mind that the food was supposed to be cooked from fresh, home made and locally sourced, I could just about justify the price and the Quiche did taste really fresh and delicious, as did the accompanying salads. 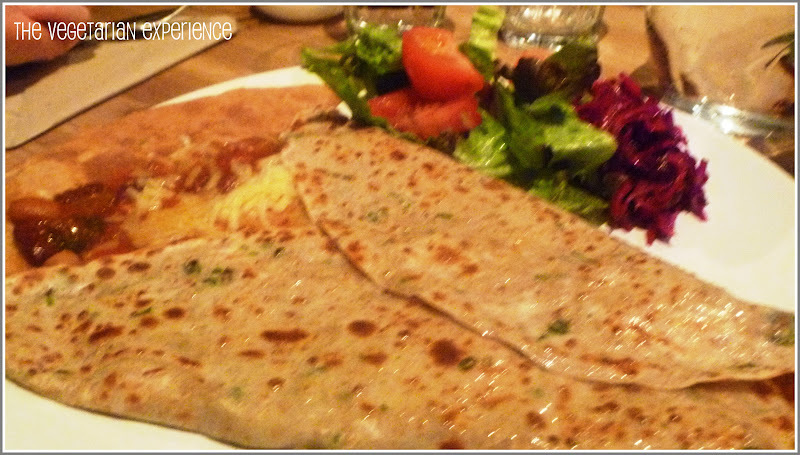 My two companions chose the Mexican High Hat Savoury Crepe - a Crepe filled with cheese, mexican salsa and beans. Again, they commented that for the price (around £8), they would have liked something other than just a small side salad served with their meal, but both agreed that their Crepe was delicious and really filling. 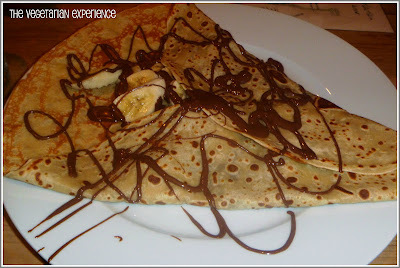 For dessert I chose a Sweet Crepe (£4.50) filled with Milk Chocolate and Banana. To round off our meals, we each chose a Hot Drink from the Fair Trade, Organic range of drinks available. Unfortunately, our Waitress (whose service hadn't been amazing throughout) took our drinks order, then obviously decided that we had ordered too late and she wanted to go home. So rather than bringing us our drinks, after about 25 minutes she brought the bill instead which didn't really go down too well with any of us and was a bit of an unwelcome end to a lovely evening. So a mixed review really. I really like the ethics of this establishment, the location and ambience are lovely and the food is really delicious too, but the price and the service do leave a little to be desired. That said, I am not put off. Woody's is great for a lunch time snack or meal with the kids, and an evening out with the grown ups. I would return again in the hope of better service and a warmer welcome. Disclosure: I paid for my own meal at this restaurant and all views are my own. If you are local to the area and would like to find out more about the local Vegetarian Parents group then do contact me. We currently have members from different areas of Herts. We meet once or twice a month and do daytime meets with the kids and evening meets for just the parents. Most meets so far have been around the St Albans & Hemel Hempstead area. Thanks Catherine, I would love to hear your thoughts on Woody's if you ever visit!